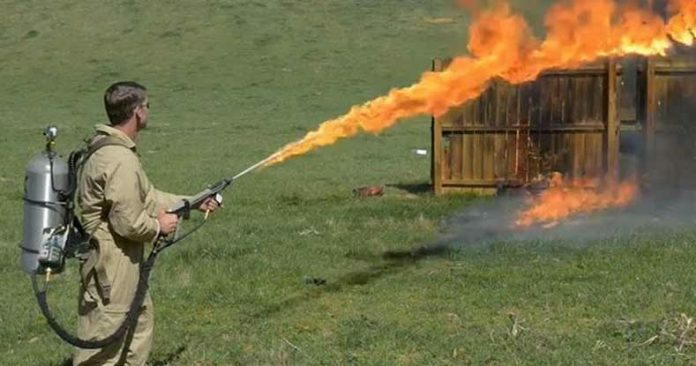 City officials in Denver are being accused of using flamethrowers to destroy homeless individuals' property, and then holding a BBQ while they looked on. Denver, CO — This week, residents and local activists held a rally outside of the Denver City and County Building to protest the ongoing mistreatment of the city’s homeless population. Attorneys for homeless victims say city officials used flamethrowers to clear people from the streets, and then proceeded to have a barbeque as the hungry victims watched. It was also reported that their property was either stolen or set on fire. As expected, representatives of the city have denied these allegations, and released a statement calling the claims “absurd.” The city is also attempting to avoid a trial through summary judgment. During the rally this week, Flores-Williams pointed out that the city’s “anti-camping” policy is aimed at removing “unwanted” residents from the city. “So what Mr. Milliner did with one statement is express the real motivation and intent behind the homeless sweeps, and that is to rid the city of unwanted persons,” Flores-Williams suggested. These accusations are truly unprecedented, even considering the current police state in America, so it will be interesting to see what other evidence is revealed in court. The city of Denver has been aggressively persecuting its homeless population in a campaign that has been ongoing in recent years. As The Free Thought Project reported in December 2016, police in Denver were caught stealing blankets from the homeless in the middle of winter. The police confiscated the blankets and camping gear claiming that the property was being held as “evidence.” The officers were enforcing a city-wide ban on “urban camping,” a measure that is popping up in cities across the country. These “urban camping” bans are an obvious assault on the homeless population who does not have a choice but to camp on the streets. At the time, Denver Mayor Michael Hancock insisted that this was a measure to help force people into homeless shelters, but according to many homeless people that we have interviewed over the years, a shelter is not necessarily better than sleeping on the street. Homeless shelters are a valuable resource, but only if a person enters one voluntarily on their own will. For a person who would rather brave the elements, being forced into a homeless shelter can be similar to being thrown in a prison. Many people prefer the freedom of a cold winter in a tent, as opposed to the institutionalized feel of a shelter, and these people should be free to make that choice without constant harassment from police. In the long term, cities with large homeless populations should consider a jobs program such as the one implemented in Albuquerque, New Mexico, where nearly 1000 people have been able to find work thanks to the new policies.